This new diet thing is very protein-based and so today, I decided to try an egg-white omelette for my breakfast. Having done a bit of research online into recipes, I ended up a bit worried that it would be tasteless and runny - according to a Martha Stewart recipe they can be watery - but I was actually pleasently surprised. Shortly before it got really messy! There's not much else to say on the subject. I treated it like any other omelette I'd make by seasoning it well with salt and pepper and throwing in a handful of coriander. Normally I'd add a splash of water too (I can't remember who I picked this tip up from or what difference it makes) but based on the research, I didn't just in case. 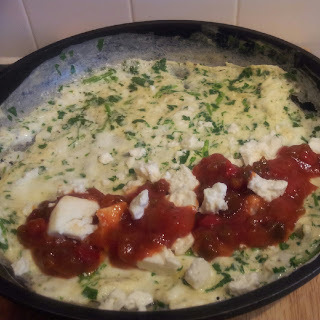 Ordinarily I'd fill an omelette with mushrooms, spinach and a sprinkling of strong cheese, but I was so concerned about this being tasteless, I went for feta cheese and salsa. In Thomasina Miers' books, wherever she recommends a medium-hard cheese for a recipe, she says that feta makes a good substitute so that's Mexican enough for me. The colour and taste wasn't as bad as I expected. The colour was probably helped by the yellow from the single yolk and the herbs. The texture was a little more rubbery than I would like but this is probably because a lack of fat from the egg yolks. One bonus was it actually held together getting it out of the pan than a regular omelette does, although next time I'd probably fill it out of the pan as I made a mess with the salsa everywhere - hence the picture of it before folding and serving. Whisk the eggs together with a fork, season generously with salt and pepper and add the herbs before mixing well. Spray an omelette pan with spray oil and heat over a medium heat. Pour in the egg mixture and stir with a rubber spatula as the curds start to form, ensuring that it covers the bottom of the pan well. When the mixture is nearly fully set, put the frying pan under the grill for 1-2 minutes to ensure the eggs are fully cooked. Use a palette knife to release the omelette from the pan and slide carefully onto a plate. 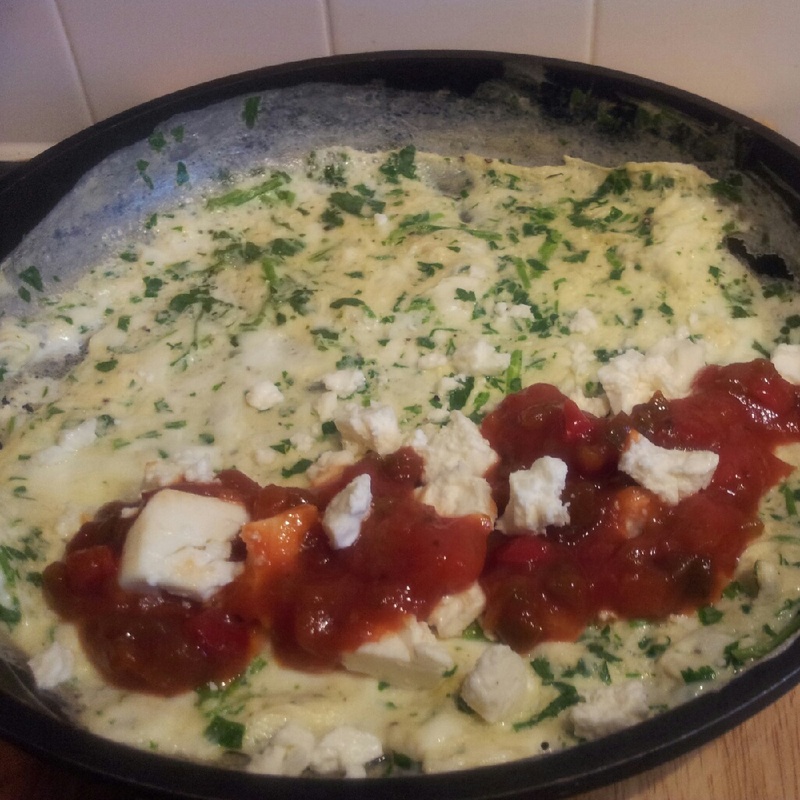 Fill with the salsa and feta before serving.